Grid Bike Racks Secure Bicycles In Upright Position for Outdoor Use. 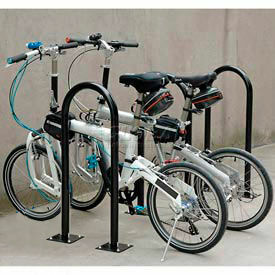 Grid Bike Racks are made from galvanized, industrial grade steel for long lasting durability and outdoor use. Available styles include 5-Bike Single, 9-Bike Single, 10-Bike Double, 18-Bike Double, 20-Bike Double and 10-Bike Double-Modern. Double styles accommodate bicycles on either sides. Outdoor bike racks can be installed using 3 optional anchor styles including Cement Anchors for new pavement, Earth Anchors for soil and lawns or 6" Spikes for existing pavement installations. Dimensions vary per model. Easy assembly. Wave Bike Racks Are Designed Without Sharp Edges For Safety. These outdoor bike racks keep bicycles secure and last through years of use. Bicycle racks are made from rugged 12 gauge steel with a polyester powder coat finish to withstand the elements. Bike storage racks measure 36"H overall with 1-5/8" pipe diameter. Choose from 3 available mounting types. 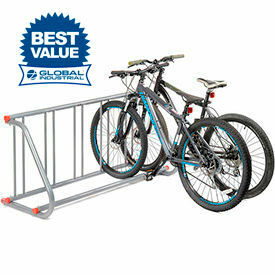 Below Grade Mounted Bike Racks (add suffix G) installs in fresh, wet cement or soil. Flange Mounted Bicycle Racks (add suffix M) allow floor anchoring in existing cement. Free Standing Bike Racks (add suffix F) have base feet for easy portability. 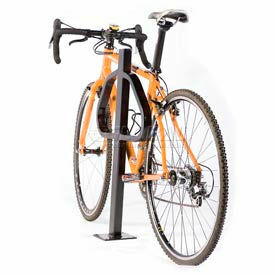 U-Rack Bike Racks And Bike Docks Hold Up To 2 Bikes In The Upright Position When Used Alone. 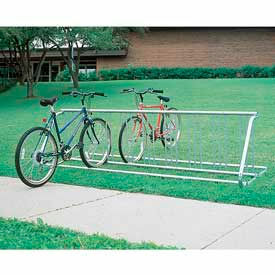 U-Rack Bike Racks and Docks are made of 1-5/8" diameter x .098 thick tubular steel to provide long lasting durability. Powder coat finish provides protection from outdoor environments. Mount types include Below Grade for wet cement or soil; Flange Mount for floor anchoring in existing cement; and Below Ground. Available colors are Black or Green. black or green. Dimensions vary per style. Bike Racks Are Great For Use Around Stadiums, Parks, Athletic Fields And More. U-rail bike rails allow double sided bike storage. Stores bicycles in upright position. Black powder coat finish. Unassembled racks are made using 1-5/8" diameter x .098 thick tubular steel. U-rails easily attach to U-channel base rails for assembly. Base rails allow freestanding, portable use or can be anchored (mounting hardware not included). All-Welded Racks are made of 2-3/8 diameter x 9 gauge schedule 40 pipe for strength that lasts. Heavyweight, freestanding steel to eliminate need for anchoring. KD Bike Racks Are Used For Securing Bikes At Homes, Schools, Hotels, Parks, Condos And More. 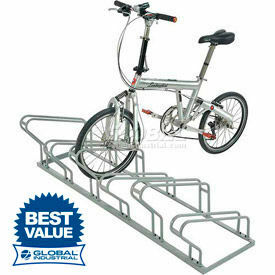 KD Bike Racks have a zinc plated construction for long lasting durability and strength. Epoxy powder coating ensures added weather resistance. Can handle up to 3 Small Bikes and 3 Big Bikes in an upright position for reliable security. Includes 4 holes for varied fastening options during ground installation. Comes unassembled. 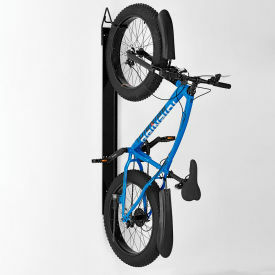 City Racks Offer A Modern Design That Provides High Security And Bike Stability. Durable one-piece square tube steel offers superior strength. Made with 2-1/2" x 2-1/2" x 7 gauge tubular steel frame and 1-1/2" x 1" x 11 gauge tubular steel hangers. Bicycle storage hangers provide 2-point stability for wheel and frame support. Anti-corrosive base with TGIC polyester powder coat finish is great for outdoor environments. Flange Mount for freestanding use allows floor anchoring for increased stability. Below Grade is used for hard soil, clay and other in-ground applications. Bike Post Racks Allow External Bike Storage And Protection For Applications Including Recreational, Public, Residential And More. 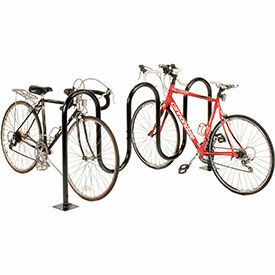 Bike post racks are made of steel for long lasting durability and dependability. Units include a 2-point wheel and frame stability support for added protection and theft prevention. Anti-corrosive base with powder coat finish provides weather and corrosion resistance. Compact design minimizes footprint. Mount types are Below Ground Mount, Flange for Existing Cement, In-Ground Mount, Surface Mount and Surface or In-Ground Mount. Capacities are 1 Bike and 2 Bikes. Color finishes are Black, Black Powder Coat, Blue Powder Coat, Galvanized, Galvanized Steel, Green Powder Coat, Powder Coat and Red Powder Coat. Dimensions vary per model. 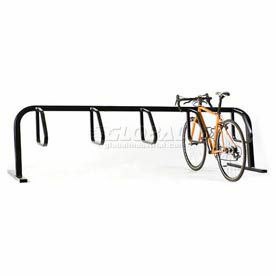 Wall And Ceiling Mounted Bike Racks Are Used For Applications Including Residential, Commercial, Storage, And More. 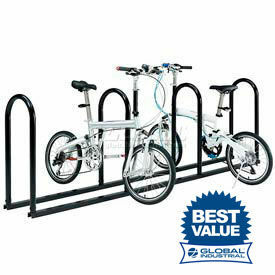 Wall and ceiling mounted bike racks are made of steel for long lasting durability and dependability. Racks provide space saving bicycle storage for basements, garages, closets, and more. Units accommodate narrow or wide wheel bikes for walls, ceilings, posts, and more. Powder coat finish ensures corrosion resistance. Hardware included for easy installation. Available styles include 1-Bike Bike Trac, 1-Bike Bike Trac/Locking, 2-Bike Bike Bunk, Bike Hangar, Bike Lift, Fat Tire Bike Trac, Fat Tire Bike Trac/Locking Cable, and Folding Bike Rack. Mount types are Ceiling Mount, Vertical Mount, Vertical Mount/Non-Locking, and Wall Mount. Capacities are 1 Bike and 2 Bikes. Dimensions vary per model.